This year I have had the incredible opportunity to join Palms Australia’s summer internship program. Not only has the internship been serving me as a stepping stone to my career, but it has also been a wonderful experience where I can push myself out of my comfort zone, learn from others and explore the wonders of what Palms does to enable people to reach beyond barriers to achieve solidarity. I did my best, with my university’s help, to prepare myself for the internship, including finding as much information about Palms as I could, jotting down what I want to achieve from the experience, identifying ways to use my strengths to my advantage during the internship, ways to develop my weaker skills, and what is expected of me. Despite having set myself up as well as I could, I still have been pleasantly surprised by how much more I can gain from this internship and what it really involves. A typical example of this would be how I have learned more Australian history and culture than I ever did at school, or better yet, essential life skills such as how to handle spicy foods, tested and approved by Palms’ staff. But of course, that’s just the start of it. “These very important skills that I’ve developed during my journey with Palms, I won’t get in university” Kelis, Marketing and Communications Intern. I was joined with other Marketing and Communications Interns, who are recent graduates or current Master of Business students from the University of Wollongong, all eager to tackle whichever challenges presented to them with the most positive attitude and energy that comes from both enthusiasm and our friendly morning teas, which seem to have become a tradition around the office. These morning teas are perfect opportunities for me to learn more about Palms and the non-profit sector, and it is very interesting for me to see that we, as interns, can contribute to Palms as much as we can gain from the organisation. As Roger, Executive Director, said “A lot of the exchange between interns and the staff happens around the meal table. The experience of interns studying in Australia, and the understanding of their culture that they bring to us, [..] is the most interesting thing for Palms”. My first project involved developing an ad creative to promote Palm’s Encounter tours, which are ethically run small group tours that provide travellers with unique travel opportunities in Timor Leste, Samoa, and Myanmar. The project has allowed me to explore different video making software, getting behind the scenes to study in detail the analytics of an ad, working collaboratively with others, and creative problem solving to ensure the process is as smooth as possible. So far, I have been anywhere between sitting at my desk seriously calculating my goals for my target reach, and finger-painting an ad prop for a video with my fellow interns. Needless to say, my tasks vary greatly, but one component is always present: fun. Ujala, Marketing and Communications intern, said “You don’t take no for an answer, and you always get to learn even more”. And that is more than true. The best part of the internship is the fact that I am allowed the freedom and flexibility to take initiative, curiously learn different methods to do my job, and try out different ideas, while still having easy access to support from my manager whenever I need clarification or feedback on my progress. The process has also been described by Anisha, a fellow intern, as “exciting and fruitful. […] Overall an amazing experience. [The staff] are extremely welcoming and helpful to interns like us, who are willing to learn”. I am also grateful to have learned how each and every employee at Palms is working with passion and a desire to help from the heart. 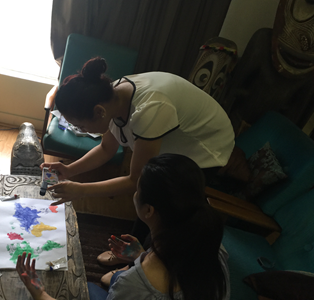 I have seen the employees work together to think of how they can make printing easier for a particular volunteer teacher in Kiribati, and I have enjoyed listening to the volunteer abroad experience of those employees themselves. The Palms culture and passion displayed by every single person in the office have me excited to come to work every day and learn more about the industry and the impacts Palms has on the communities they work with. As Kelis said “I treasure the relationships I’ve built during the journey. Everyone was extremely nice, helpful, knowledgeable, and taught me a lot. I feel proud to contribute”. This has been an enriching and unique internship experience, and the amiable and welcoming culture of Palms will make it that much harder to say goodbye to everyone in March. However, I know the next two months will still be full of new experiences and opportunities to learn, and I am more than ready for the challenge! To see the work of Palms Australia Marketing and Communications internship students, ‘Like’ us on Facebook and follow us on Instagram and stay tuned for upcoming videos. When tickets start at $130, is International Women’s Day achieving #BalanceForBetter?